Built in 1864, the historic red and white structure, home to the Boar's Head Lighthouse stands high on the cliffs of Long Island near Tiverton, Nova Scotia watching over Petit Passage in the Bay of Fundy. The lighthouse still operates today aiding vessels in their travels as the Bay of Fundy around Long Island can become hard to maneuver through at times. 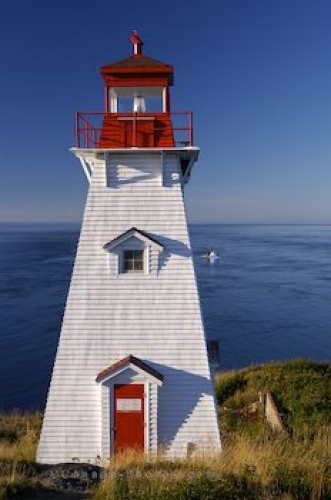 Standing at a height of 33 feet, the light atop shines across Petit Passage in the Bay of Fundy for 12 nautical miles, flashing every 12 seconds. The white, square pyramidal tower with its red lantern was automated in 1987 and has helped many vessels over the years. Long Island is approximately 15 miles in length and 5 kilometers wide and visitors can explore all the hidden areas along the coastal shores and the Boar's Head Lighthouse in a day. The lighthouse is often closed off by a gate to stop vehicles from entering, but visitors are welcome to walk to the cliffs and admire the historic lighthouse and enjoy the scenery. Picture of the Boar's Head Lighthouse on Long Island near Tiverton, Nova Scotia in Canada. Boar's Head Ligthhouse on Long Island, Bay of Fundy, Digby Neck and Islands Scenic Drive, Highway 217, Nova Scotia, Canada.